Over the years, as new building materials become available, standards updated and we learn more about energy efficiency the Kids Under Cover studio has evolved in both design and materials. Often when we build a new studio or re-locate a studio the recipient may wonder why it looks a bit different to one they may have seen on our website, in photos or onsite. In the beginning, studios were built from Weatherboard (Weathertex) material. 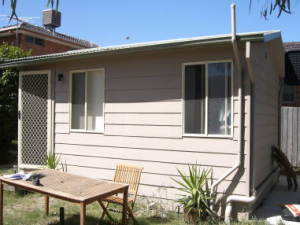 Weatherboard or Weathertex was used up until March 2009 when it was replaced with Colorbond material. Studios were constructed with stud walls until March 2013 when Modular Frame construction was introduced. 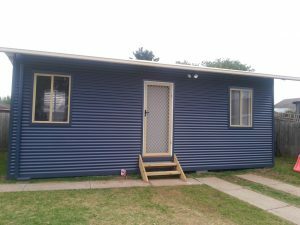 Today a Kids Under Cover studio is made from Colorbond Energy Efficient material, additional windows and bench shelving units have been added and other design considerations are in place to ensure energy efficiencies such as the orientation of the studio, ventilation, insulation and double glazed windows. Today a Kids Under Cover studio has a 6.2 Star Energy rating. Our builders, Harris HMC advised us that Weatherboard and Weathertex are essentially the same material so when speaking about our studios we would refer to the outside material as ‘Weatherboard’ in lieu of Weathertex to aide communication over the years. 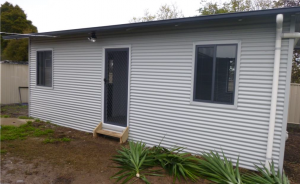 Colorbond clad studios with modular frame construction. Additional design considerations to achieve energy efficiency include: orientation of studio, ventilation, insulated & sealed subfloor system, shading, double glazed windows and insulation to roof cavity. To help reduce the financial impact on families and carers with a studio, we have implemented an energy efficient package to our studios, giving them a 6.2 Star Energy rating. 6-star energy package includes double glazed windows, an insulated floor system, additional ceiling and wall insulation. Low embodied energy – manufacturing process and use of local raw materials results in Durra Panel creating a low level of embodied energy. Positive social impact – use of an agricultural biomass by-product in regional areas to provide additional economic activity. Recycling and disposal – Durra Panel is biodegradable. CO2 Emission sequestration – Durra Panel traps CO2 emissions that are in the atmosphere. Indoor environment quality – No additive chemical binders are used in the process of making Durra Panel and as such it has very low VOC levels – healthier indoor environment. When a studio is located in an area with a Bushfire Management Overlay (BMO), they are installed with Bushfire Attack Level 40 compliance. There is no noxious foam based materials used.